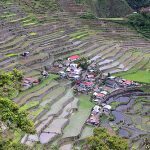 I have recently talked a lot about all sorts of different places to meet girls in Manila, and they all had more or less one thing in common: Those were hookers who would only “go with you” if you give them some cash afterwards. I already explained how to use the dating sites in another post (see the link above), so today I’ll explain the second type in more detail. It’s not a big surprise that Manila as the capital has the highest number of malls in all of the Philippines. It can be a little bit overwhelming to decide where to go to look for girls and so I decided to put together a list of the three best and most popular malls in town. So how do you “pick up” girls in the malls? Well, first of all it’s important to know that there are also plenty of freelancers in the malls I’m about to describe (I will mention the exact spots in these malls), but again this guide should help you to meet “normal” girls who are not primarily out for your money. The types of girls you want to look out for are primarily those who visit the malls by themselves, means without any friends. Of course it’s also possible to approach them when they come with a friend or two, but it just makes it more difficult because they will probably act more shy and reserved in front of their friends. Similar for girls working in the stores, yes you will see some real cuties in there but if you decide to say hi, make sure there are as few people watching as possible, because again if she feels like she’s being watched then she will probably just giggle and not start a real conversation. So how to approach them? I usually find these two methods most effective: First, you could ask them for the direction in order to start a conversation. Means you could say “Excuse me, do you know which way is it to Manila Bay?” Remember to always be gentle and smile and after she has replied she will either ask you “Are you on vacation?” and if not you could start digging again by saying like “Oh I see, thank you. Have you been there before? Is it nice?” That should do the trick and then next you could ask her for her phone number “just in case I don’t find it” (in other words: to arrange a date with her later) or just make a move to the next girl if you have the feeling that she has a boyfriend or just doesn’t feel comfortable for whatever reason. And the second way you can go about it would be to write down your phone number or facebook contact on a small piece of paper and simply give it to her. This will give her the chance to contact and chat with you without other people watching her, which is her biggest concern and your biggest obstacle in 80% of the cases. So before going to the mall, write down your contact on 10 or 20 papers so you are well equipped when going out. Tip: Include a nice little message like “You are really cute” along with a smiley. Whatever way you choose, don’t overthink it too much. It’s really a numbers game. Like Filipinos always say: Going fishing. If you don’t catch a fish during the first 20 minutes, don’t worry, there are plenty of more fish in the water and one will eventually bite. There’s no doubt about that as long as you just continue fishing. By far the most popular area for people to hang out is Café Havanna and Starbucks at Greenbelt 3. 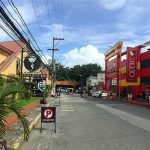 Here you will find both tourists and expats, as well as local Filipinos, among them many girls (and also a few ladyboys) who are just feeling bored so they grab a cup of coffee and sit down in the outside seating area or patio to play on their phones or do people watching. The perfect playground, and you may find yourself repeatedly going back to this place in the afternoon not just because you don’t know where else to go, but especially because of the nice and relaxed atmosphere. The mall of Asia is the biggest shopping mall in Metro Manila and just a huge magnet for both Filipinos and foreigners of all ages. It has a great location right at the Manila Bay, so if you manage to successfully talk to a girl there, you might as well go on your first date right away by walking down the promenade at Manila Bay. If you go there at around 6pm you can also experience a fantastic sunset – provided there are no clouds in the sky. Always nice to hang out there for a while and the fresh sea breeze also feels good after the heat in downtown. Or you just walk around inside the mall, again the area around Starbucks Coffee (see the map below for the exact location) is very popular for Pinays to sit down for an hour or two and just relax. The only downside of the Mall of Asia in terms of picking up girls is that it’s always quite crowded so most girls will be too shy to talk to you right there as people will start watching you. So in most cases it might be better to just give her a paper with your phone number on it (remember to smile at her while you do that) and then if she doesn’t have any plans (which is usually the case) you might even receive a message from her 5 minutes later. Make sure to watch my short video at the end of this post so you get some good impression of the Mall of Asia and the romantic Manila Bay. 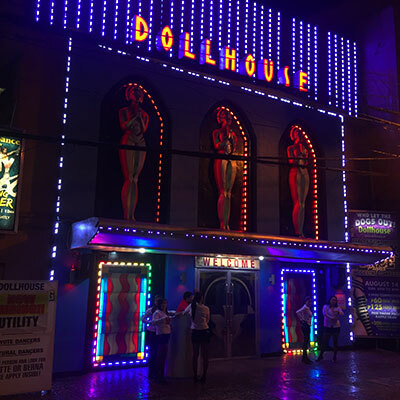 You will no doubt visit the Robinson in Malate sooner or later during your stay in Manila, and that’s because it is right in the center of the red light district of the same name as well as right next to Ermita which is yet another area with plenty of bars, massage salons and street freelancers. The whole Malate area is a little chaotic to be honest and you need to watch out for all the touts trying to sell you something, and so you will feel a great relief and security as soon as you walk into this air-conditioned mall. There are several restaurants on the second floor, as well as a cinema with the latest Hollywood movies on the top floor (great activity if you have just met a new girl) and then on the ground floor you have even more cafés and western (franchise) restaurants. Once again Starbucks has the nicest location here and if you sit in their outside area you will get great views of the main entrance where many girls just stand around while waiting for someone (or pretending so). There are a lot of hookers here, but also more than enough nice and “normal” ladies you can talk to. I’d recommend you to visit these malls in this order: Greenbelt 3 which has the nicest atmosphere, then Mall of Asia which has the highest number of people (and also beautiful Manila Bay right next to it) and then Robinson Malate which has a lot of hookers but also plenty of normal girls and it’s right in the nightlife area – I suppose you want to have a beer later on if you don’t get lucky that day. Or you just ask a girl if she wants to join you for a beer and pool game. Whats your ethnicity op? If you’re American or an Expat (which I guess you are), then you shouldn’t have any problems with all the stated methods. I’m Asian so I guess that would be tough for me. *Laughs sadly.